Note: Step 4: Reviewing Applicants and Step 5: Approval to Interview must both be completed in order to submit your short list for approval. Prior to reviewing any applicant materials, the search committee should meet with the hiring official to review and clarify the meaning of the minimum and preferred qualifications. This will ensure all members of the committee understand and are on the same page as to what the qualifications mean and what the committee is looking for in a candidate. The review of applications process needs to be thoroughly documented. The search committee must keep accurate records of the process through the creation of an applicant log. The applicant log will reflect the committee's final decisions on the qualifications of all applicants. Login to PeopleAdmin (employment.unl.edu/hr) and open your requisition. Open More Search Options and make sure both active and inactive applicants are listed. This creates a spreadsheet of your applicants. You may need to search in your Downloads folder for the file. Once you open the file, you may need to click Enable Edit. 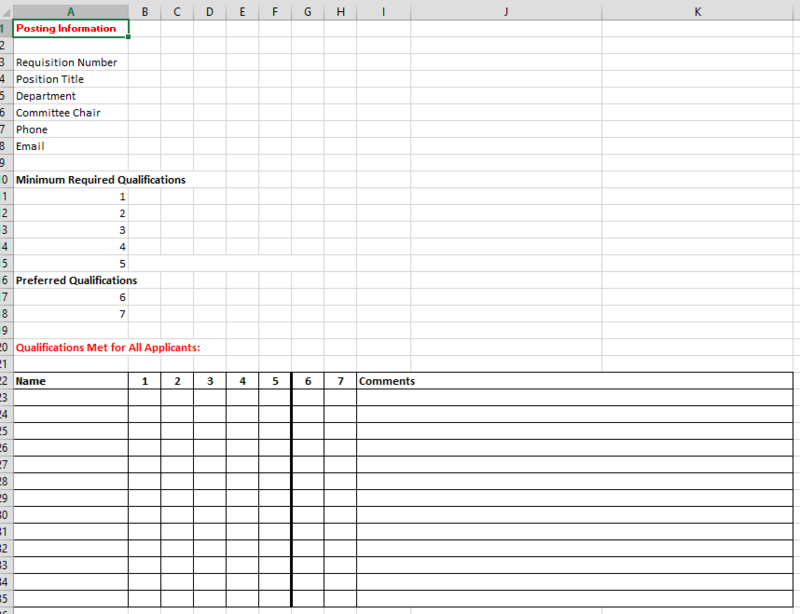 Copy your applicant list from this spreadsheet into the blank applicant log provided by IEC. All applicants must be listed on the log, including late applicants whose materials you may not be reviewing. Sort your applicant list alphabetically and enter your minimum and preferred qualifications in the spaces provided. Add or remove rows and columns as necessary. Your applicant log must include the following information: 1) requisition number; 2) position title; 3) department name; 4) search chair; and 5) contact information for the search chair. Indicate whether or not each applicant meets the minimum qualifications. If you are using a scoring system, a key must be included. Step 5: Approval to Interview must be complete prior to submitting your short list to IEC. When you are ready to submit your short list, notify us via email (equity2@unl.edu) and attach the log you have just created. If you have any questions, please call our office at 402-472-3417.